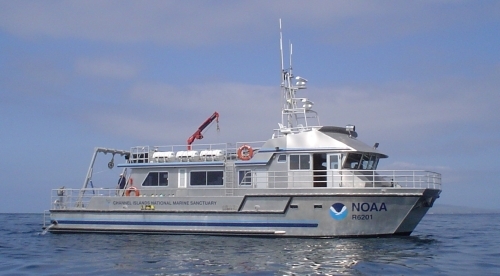 The Channel Islands National Marine Sanctuary's 62' high-speed Teknicraft catamaran is used primarily as a platform to conduct ecological and oceanographic research in the waters of the Santa Barbara Channel in Southern California. 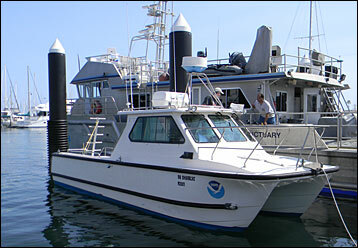 The vessel also serves as a host for educational field trips and emergency response in and around the Sanctuary. The A-frame and winch are used to conduct trawls, CTD casts, sediment sampling, and deploy equipment such as sidescan sonar and ROVs. The wet and dry labs allow on-board processing of samples and data. Dive operations are supported by onboard facilities and equipment. Projects on R/V Shearwater have included sea bird research, archeological/cultural research (primarily shipwrecks), monitoring marine reserves, studying whales, mapping eelgrass, and oceanographic sampling. On board berthing, stowage, galley and safety equipment allow for multiple-day excursions with scientists and crew. The Channel Islands National Marine Sanctuary's 28' twinhull power cruiser is used as a platform to support single day dive and emergency response operations. Dive support capacity includes the ability to carry up to three divers, with two tanks each and is outfitted with a dive ladder, oxygen, AED, and backboard. The endurance of 6 – 8 hours at continuous cruising speed of 25 knots makes the R/V Sharkcat an important asset for rapid response to emergencies that occur within the sanctuary.